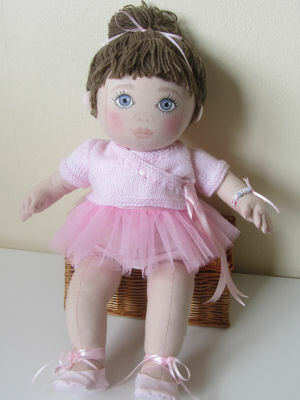 I made my Bettina toddler doll from Darlene Rausch's lovely doll pattern Trina. 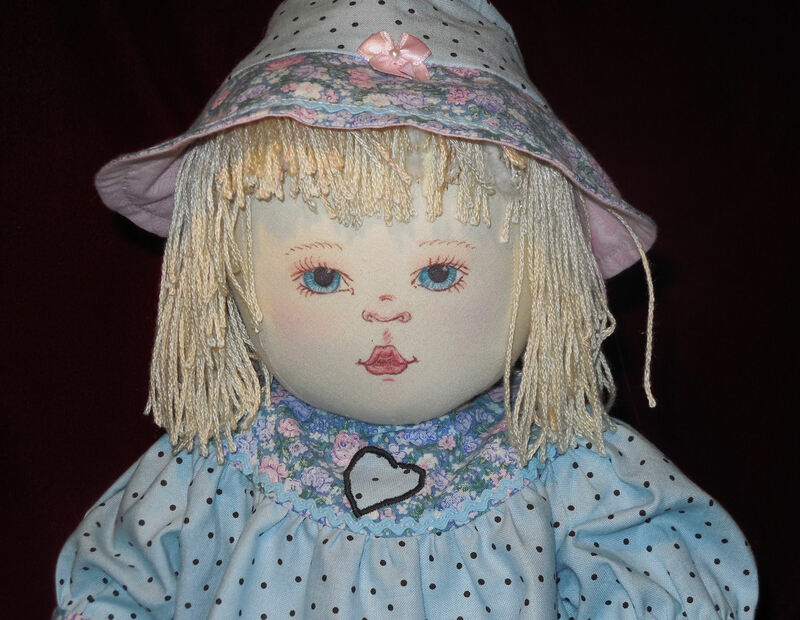 Darlene's patterns has no seams on their face that's why I love them so much. 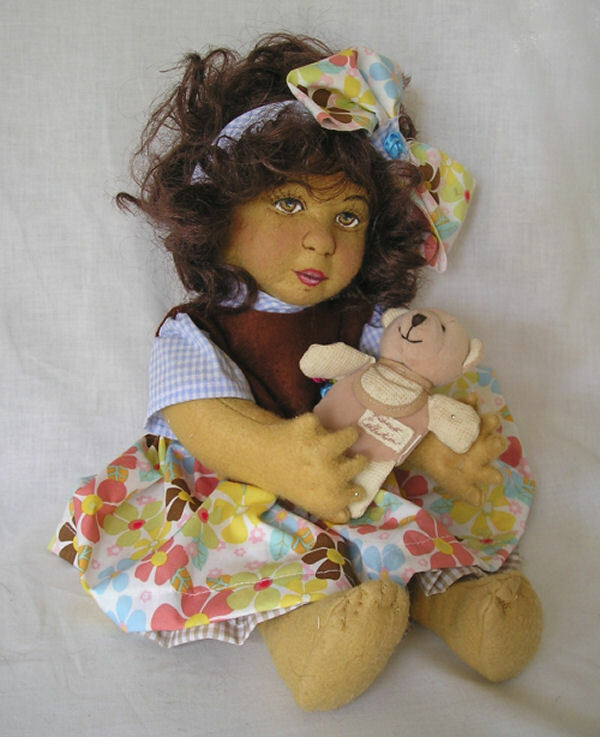 Bettina is a large doll. 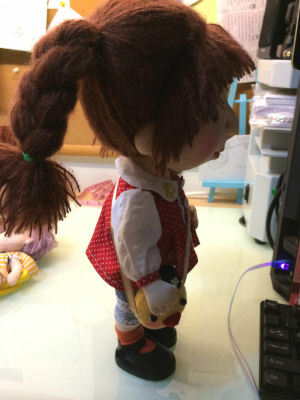 She is about 27 inches tall. 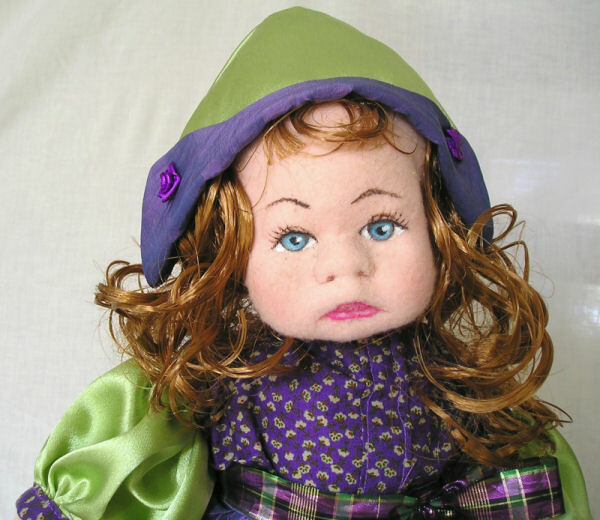 She is soft sculpted and made from polyester knit fabric. Her eyes and lips are painted with acrylic paints. 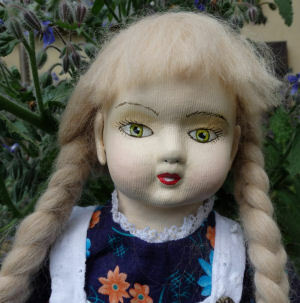 Her eyelids and eyebrows ere embroidered. 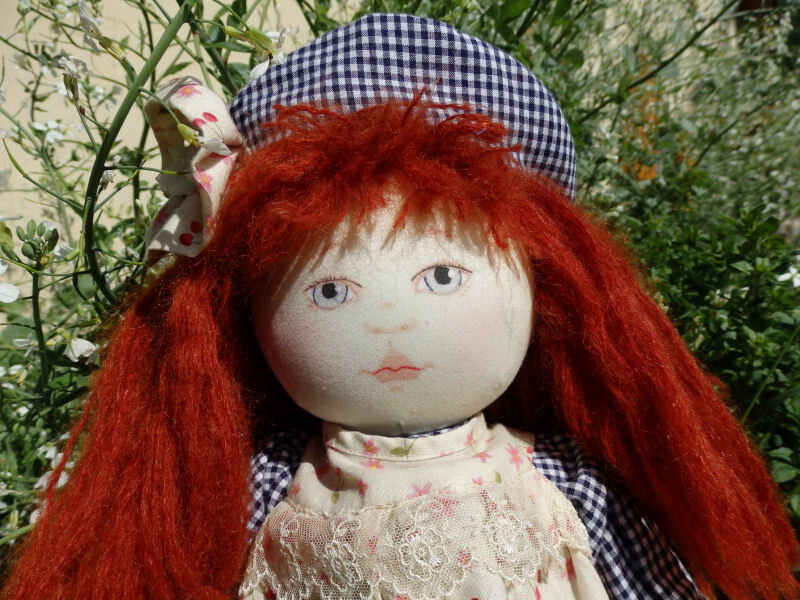 Bettina has strawberry color curly wig,which is hand sewn to her head. 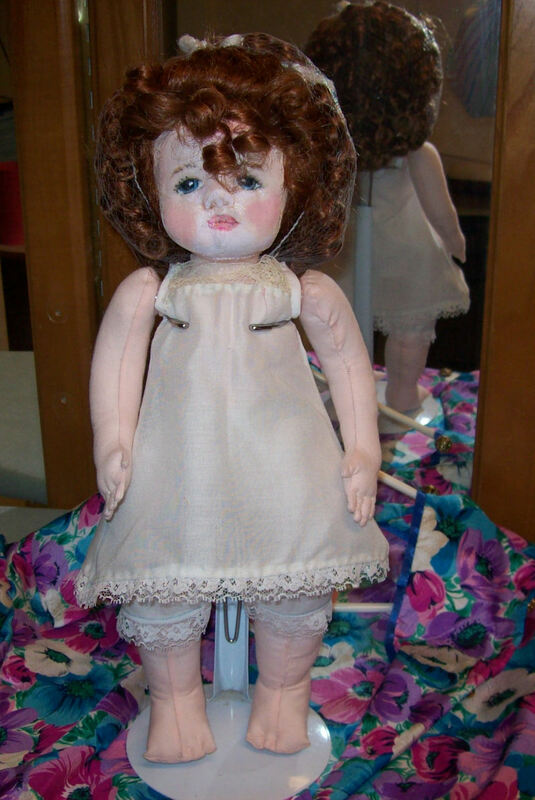 Her arms are movable, because they have joints. Legs are seam jointed. Bettina is 4 years old girl. She is going to her grandmother's birthday party. 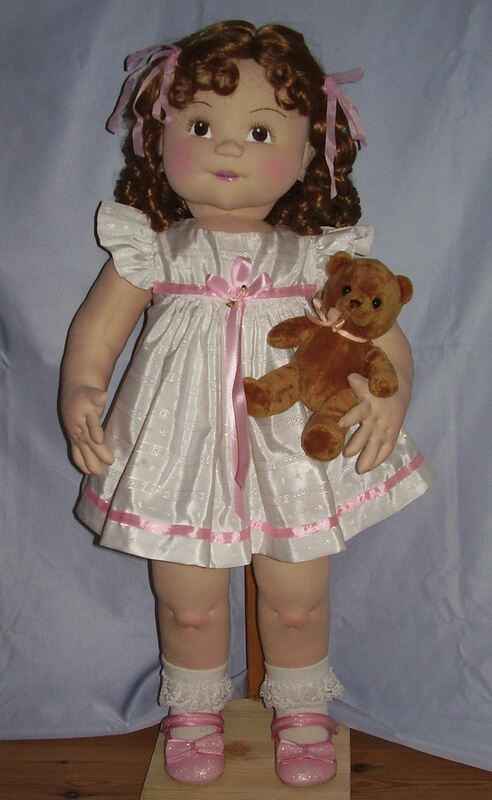 She wants to take her old teddy bear with her. Bettina's mother wants her to wear apron on her dress, but Bettina wants to go to the party without apron. Her mother made her dress from satin fabric and trimmed it with lace. Her apron is made from polyester fabric and trimmed with satin ribbons. She can wear the apron alone as a summer dress , when it is very hot. Her shoes, socks and teddy bear are purchased. 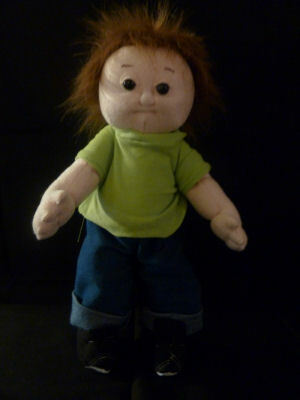 Noah--A cute little 4 year old boy. Noah is approximately 22" long. 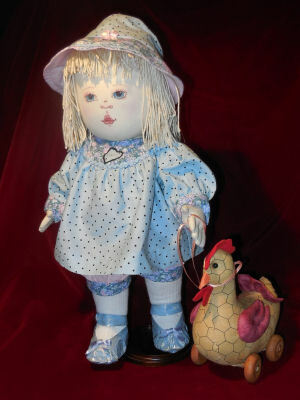 He was constructed in craft cotton using a combination of Judi Ward's pattern for "Bobbi",a simple baby doll,from which I used the body & limbs & Kezi Matthews "Blye & Colton" pattern which I increased the size of the head to fit the "Bobbi" body. I painted the face entirely freehand using acrylics,coloured pencils,fineliner pens & blusher. 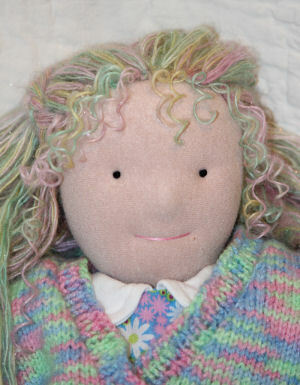 I made the hair from knitting yarn. 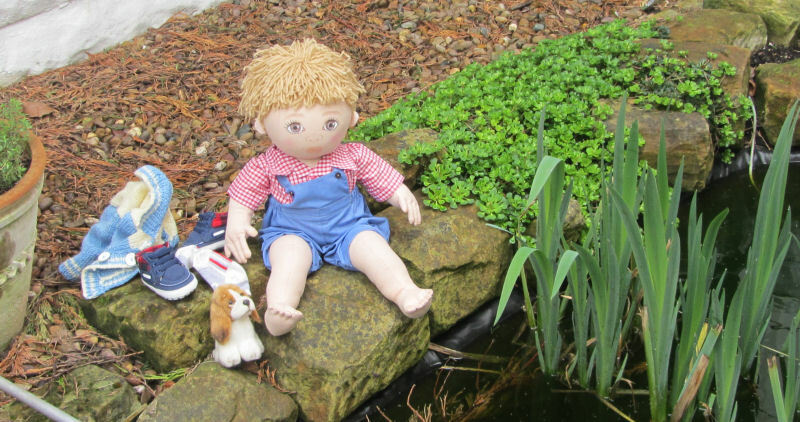 Noah is wearing a shirt & dungarees of my own design & make. His jacket is knitted by myself using a purchased 1st size pattern & he is wearing purchased tiny baby socks & 1st size baby shoes. 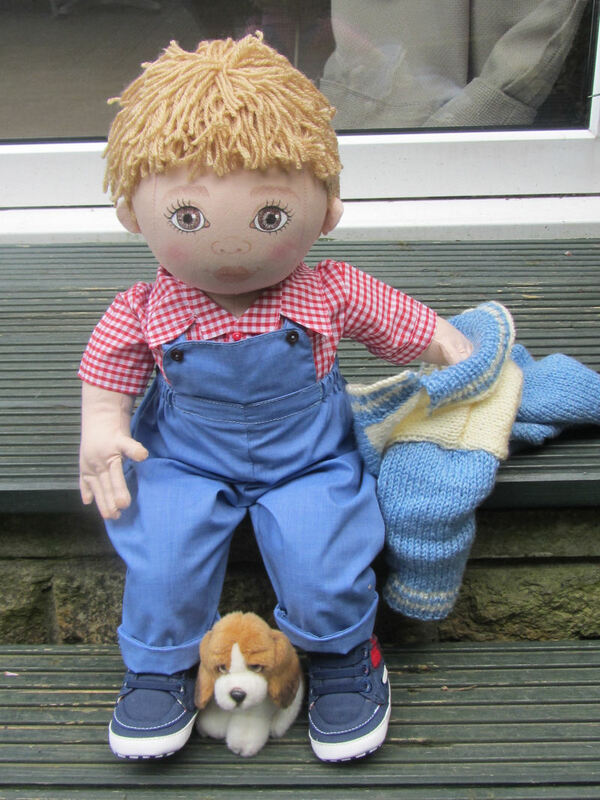 Noah loves to play with his basset puppy,Woody(purchased toy dog). Hi my name is Betty and I'm two. I have on my new robe that Momma made me for Easter. I'm really thrilled to have this as its cold out, hunting eggs. This is just a standard doll pattern, that I've added my sister's face to from an old picture of her. 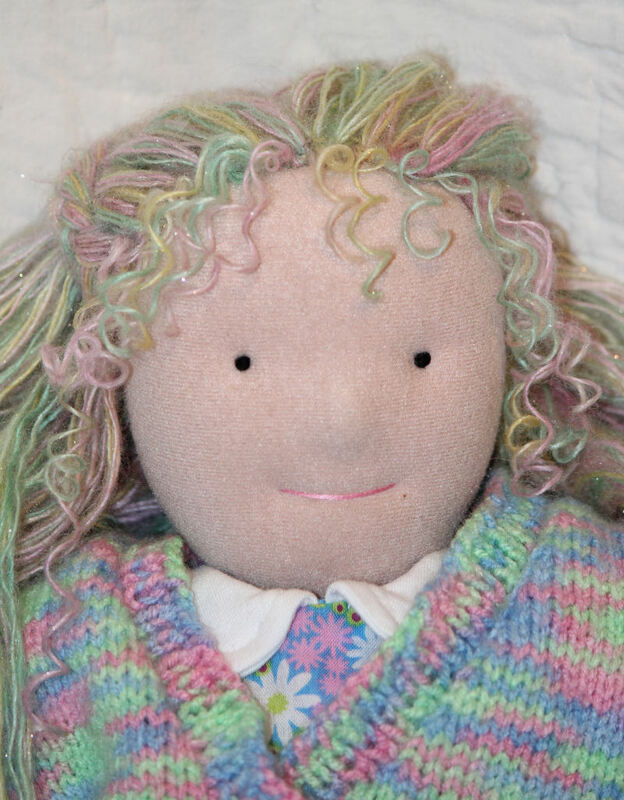 I found some old chenille and colored it with Easter Egg dye. 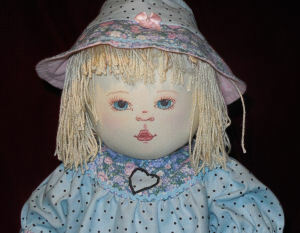 Her name is Veronica made from a pattern from Sue McMahon which included a clay mask covered with cotton. 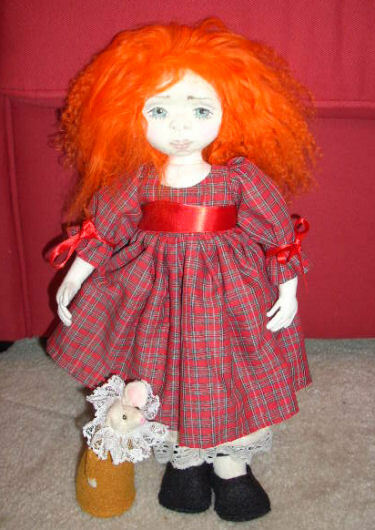 She has bright red hair and loves to play with her mouse Mr. TibBits. 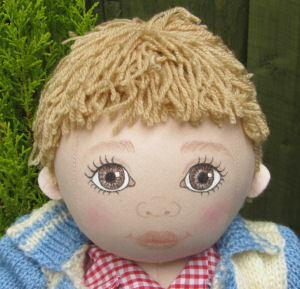 He was made from a pattern from soft doll magazine. 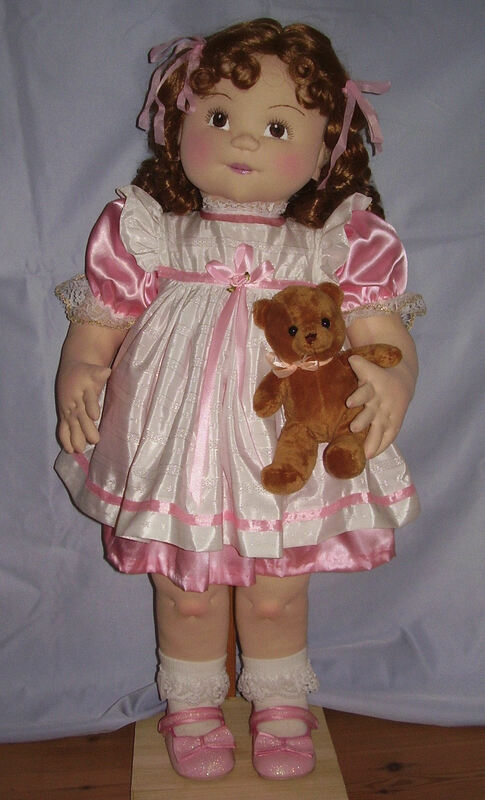 13inch six years child doll. All natural materials. 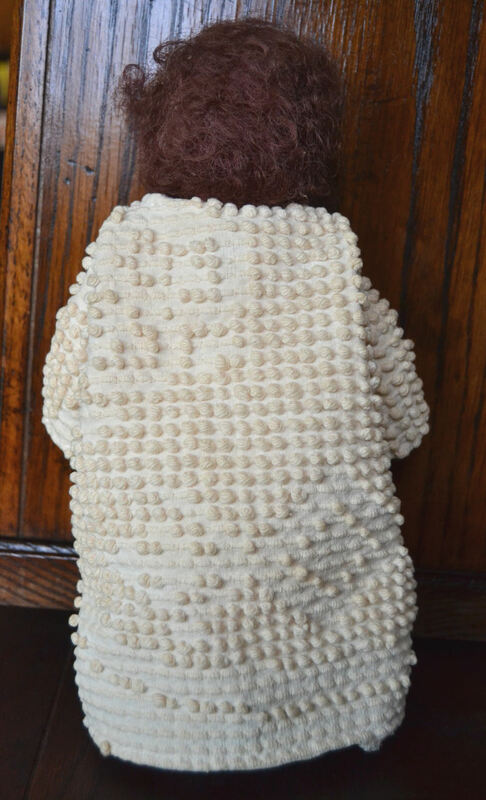 Soft cotton interlock body, pure wool stuffing, Mohair hair. Acrylic color painted face. Cotton clothing and handbag. These are my own patterns for both child doll and clothing. 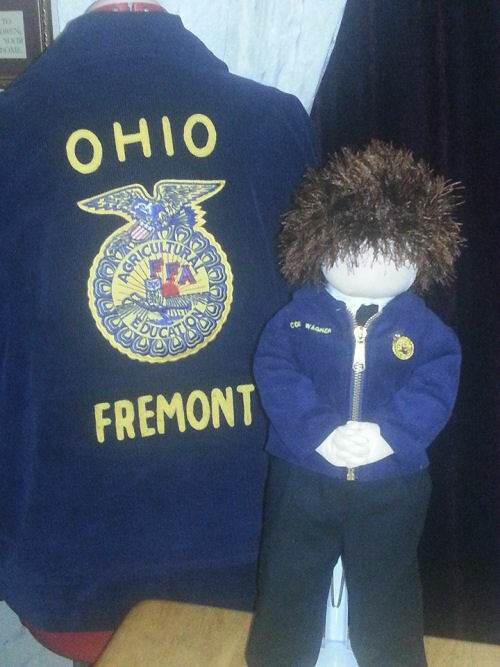 Cody is made using vogue craft pattern 9833. he was made for this contest and donated to our local FFA chapter. The inspiration for him was a trip I took with the FFA group to national convention. what an amazing group of kids. He is dressed in official FFA dress. imagine seeing thousands of these blue jackets. 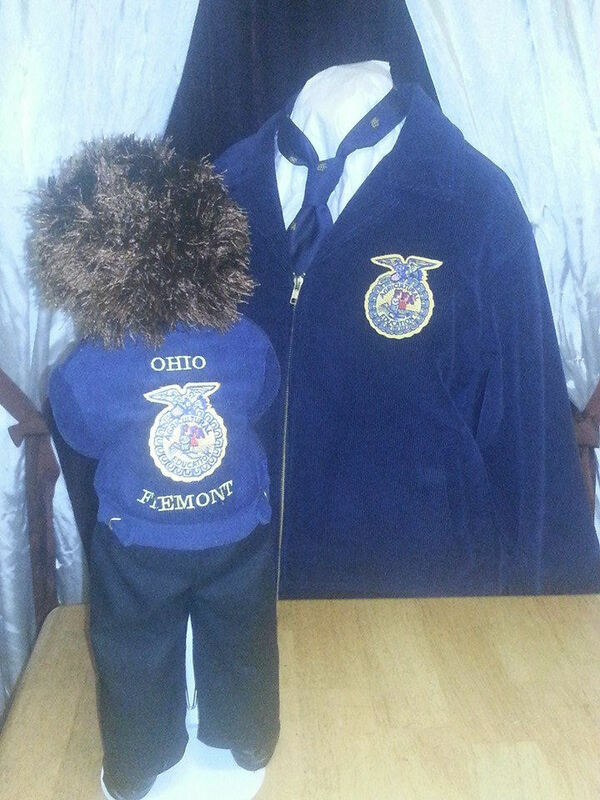 His blue corduroy jacket is custom made with patches and pins from the national FFA organization. He stands 18" tall and all clothing was custom made by me. 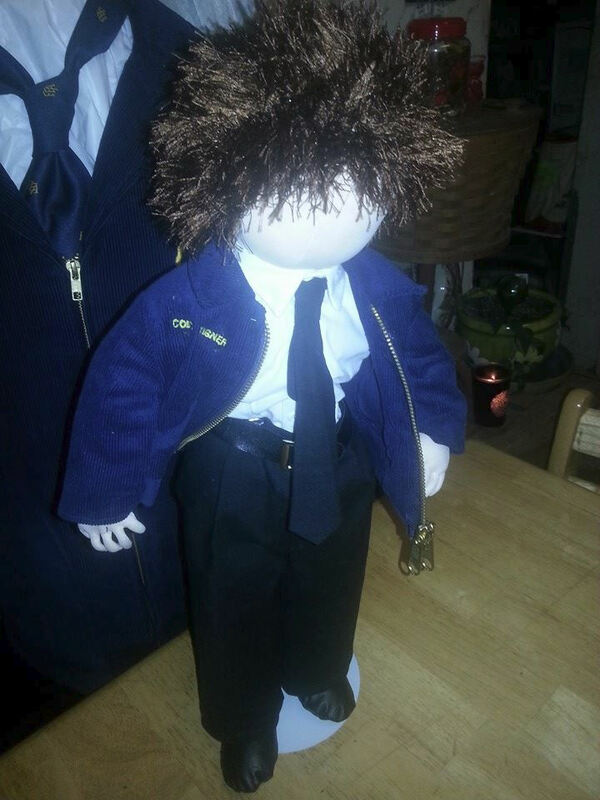 He has no face that way he could represent any of the young people involved in FFA. 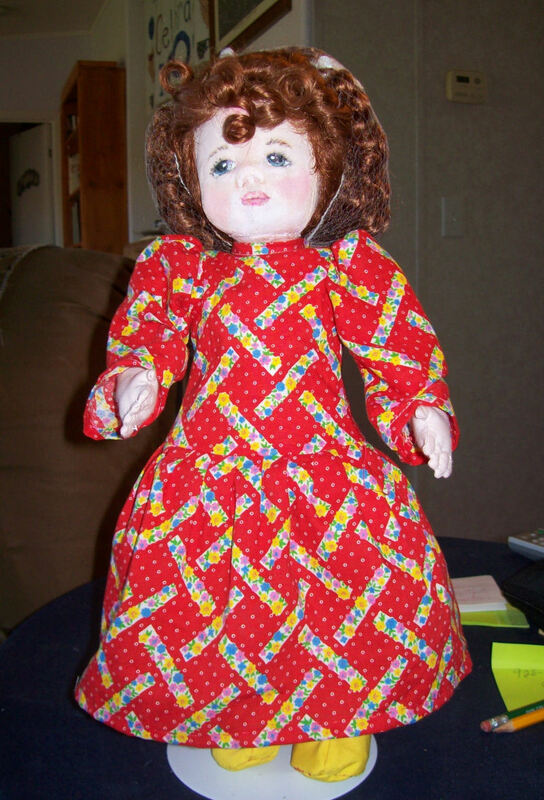 This doll is made using the Alsea pattern by Kezi Matthews. She's in muslin and button jointed at arms. 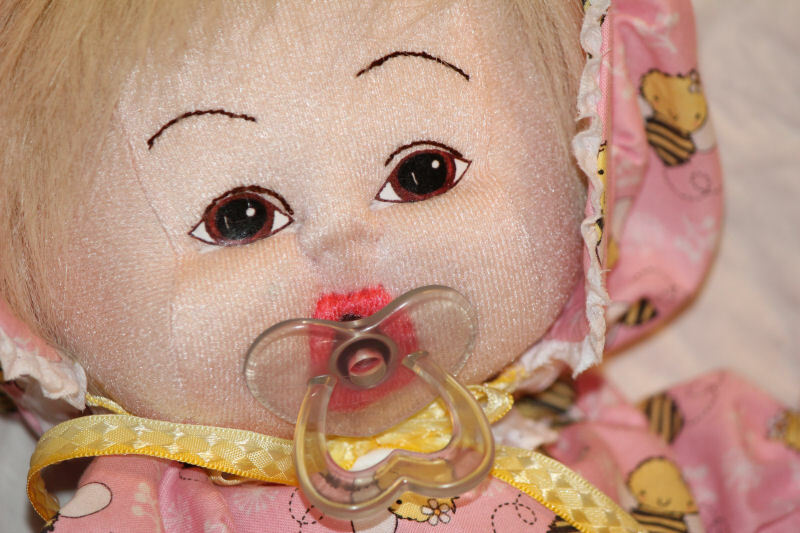 She's stuffed with polyester fiberfill. Her face is made with pens and pencils. 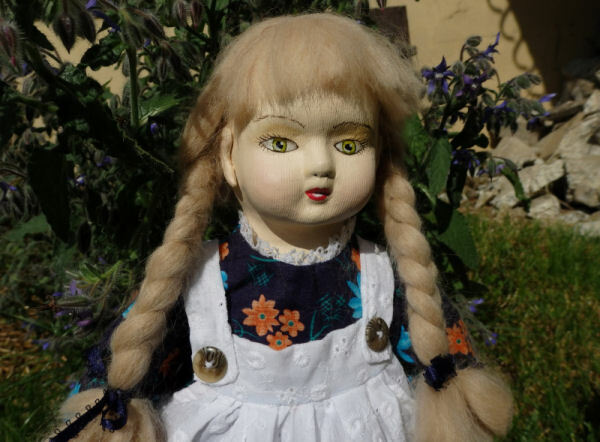 Her hair is mohair. 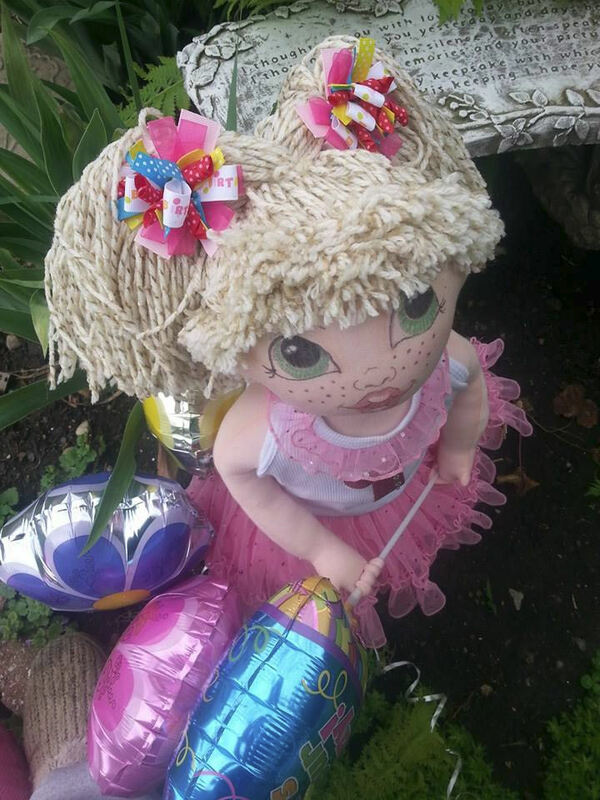 I chose to crochet a bonnet and add the hair one by one. Her clothes are made from the pattern, too. 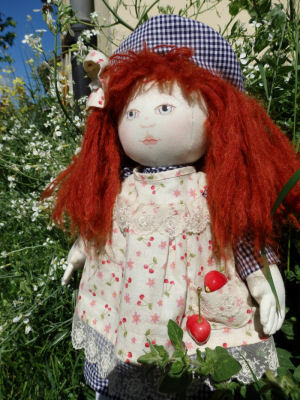 This little red head girl loves cherries. She has some in her pinafore and if you look closely, you'll see real cherries in her pocket! 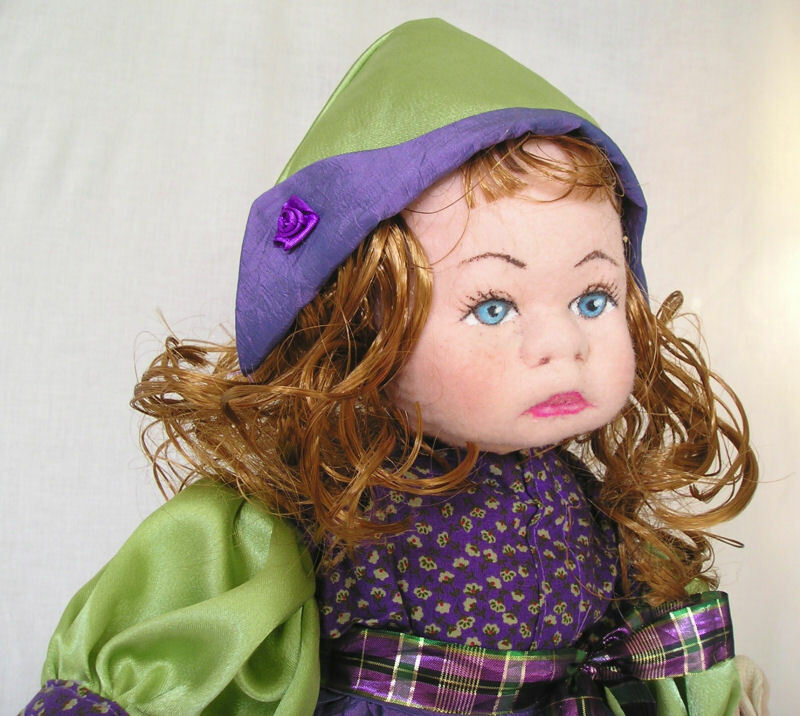 This pattern is "Kimmie" designed by Carolee Creations. 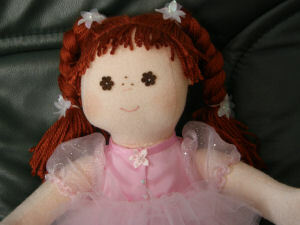 I made her from very soft craft velour, embroidered her sweet, freckled face, and braided her cute auburn hair. 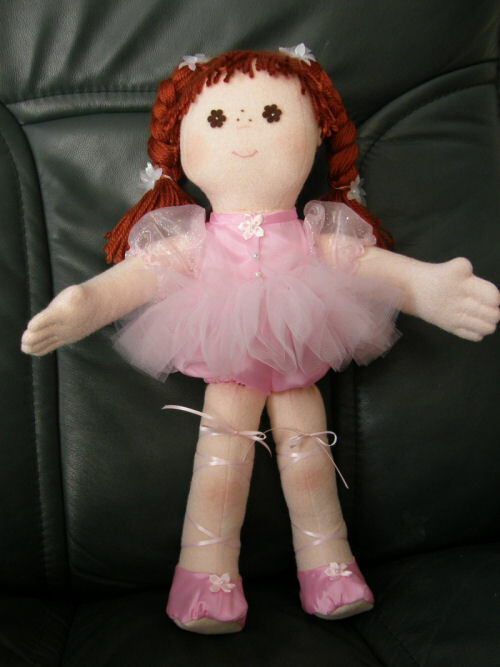 Kimmie's ballet suit, tutu, and ballet shoes are all Carolee's design. 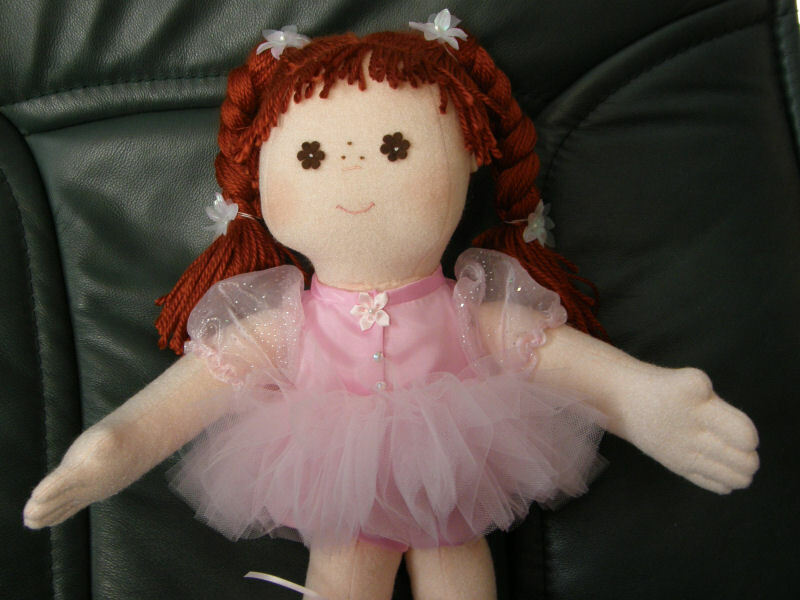 I adapted the ballet suit by making the tutu a separate piece that can be removed and replaced with a different color and/or length tutu. I have entered this pattern by Carolee Creations to honor Carolee and show my appreciation for her designs and the pleasure the dolls made from her designs have brought to me and those who received one as a gift or purchased one that I made. She is a Pacific Northwest Native American doll. 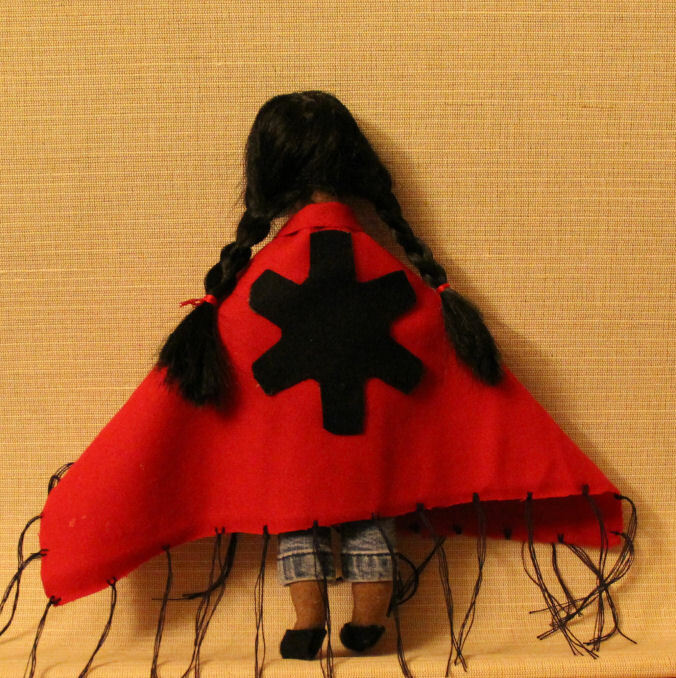 Little Turtle is practicing the girls' shawl dance for the next local pow wow. 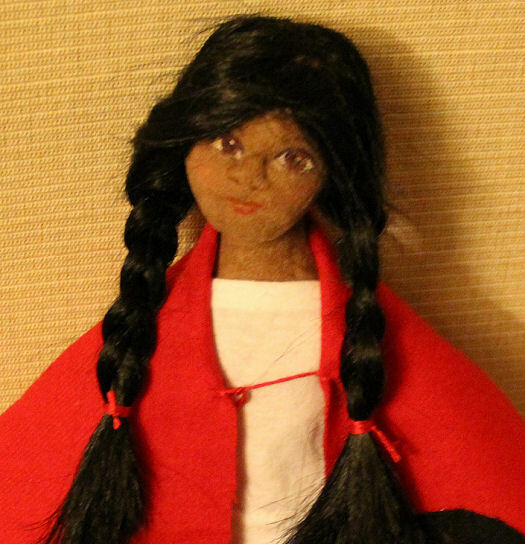 She loves to dance and is happy she has her own wool shawl like her mother's for the dance. Little Turtle is made of suede cloth from Judi Ward's Bluette Manikin pattern. 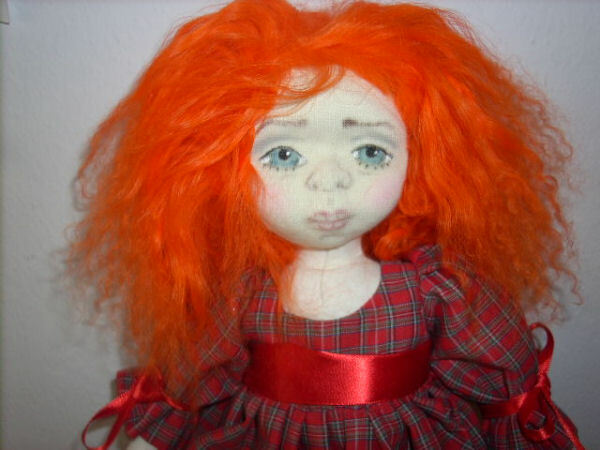 Her hair is a re-purposed Halloween wig. Her jeans are made of an old pair of mine, her tee shirt is cut from a larger white tee. 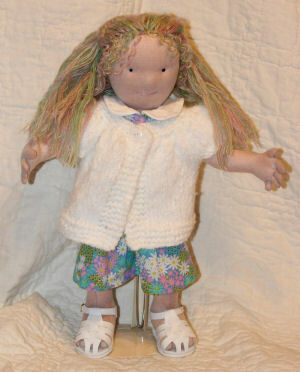 She also has new wool dance slippers and a new wool shawl with salmon and sun appliques. 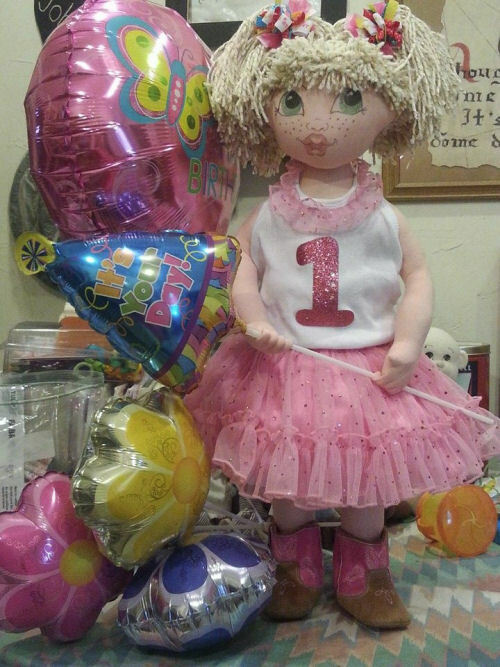 Dilley is an adorable toddler only 14" tall. She is wide-eyed and curious yet a little shy as only toddlers can be. Dilley is made completely of woven cotton. 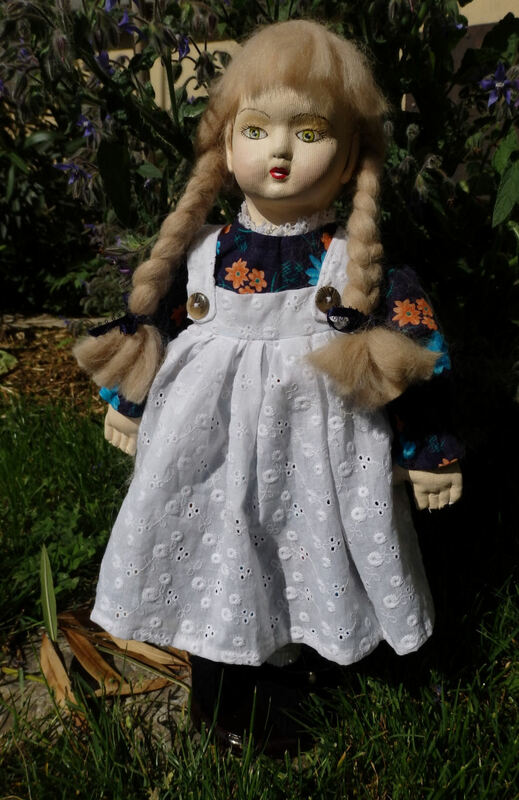 Her darling dress, bloomers, bonnet and Chick are fabrics from my remnant bin and finally, the shoes are constructed from painted tyvec. 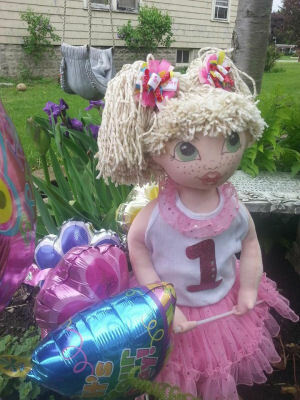 Her face is painted using a combination of markers and colouring pencils and her hair is made of yarn. 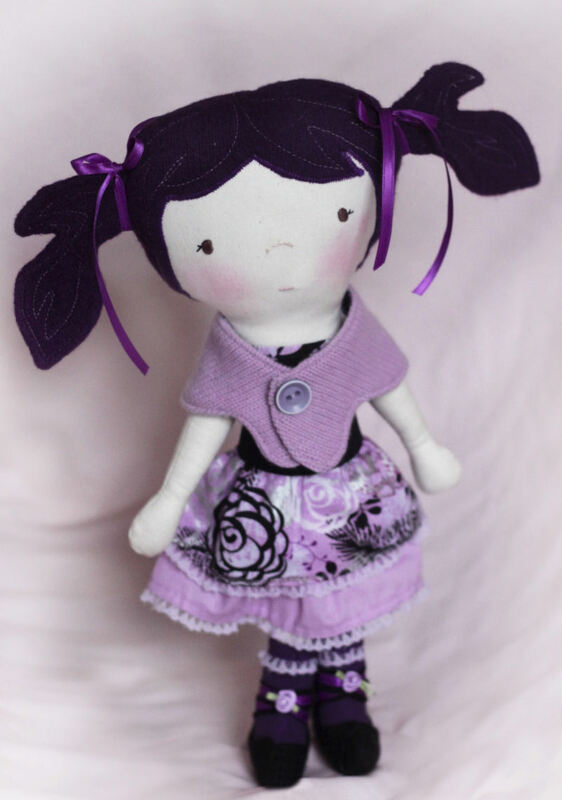 Violetta wears all purple in support of Epilepsy Awareness, a disorder that two of my children live with. 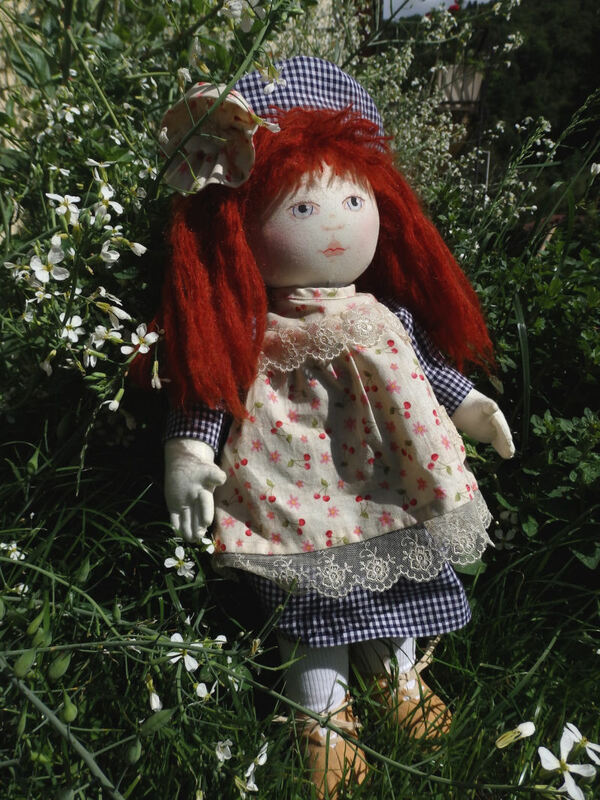 She was made from a Simplicity pattern. Her hair is made from an upcycled grape purple lambswool sweater, and her removable cape from an upcycled violet cashmere sweater. Violetta has seizures, but she takes medicine for them and she still lives the life of a normal little girl! 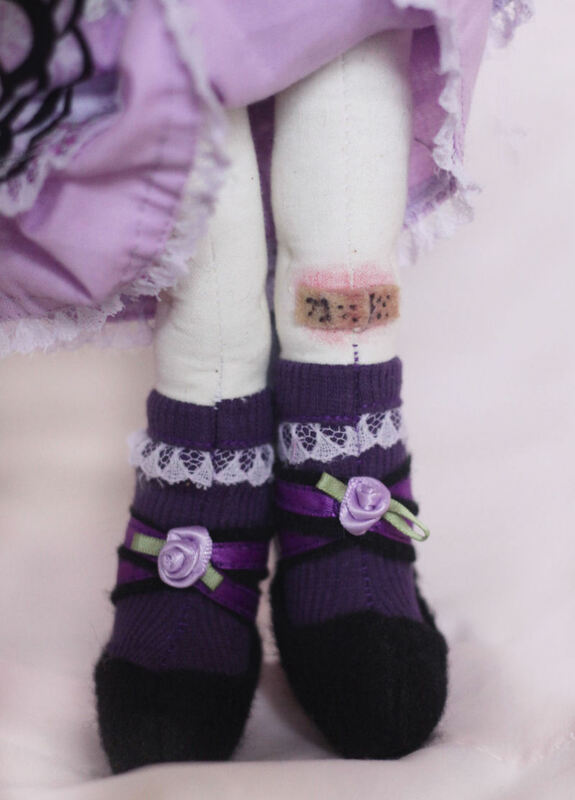 Since she is still occasionally unsteady on her feet, she often has boo-boos; and so she had to have a Band-Aid on her skinned knee. But she still looks beautiful in her purple dress that hides her little secret well, and also wears her favorite shoes to match her dress. 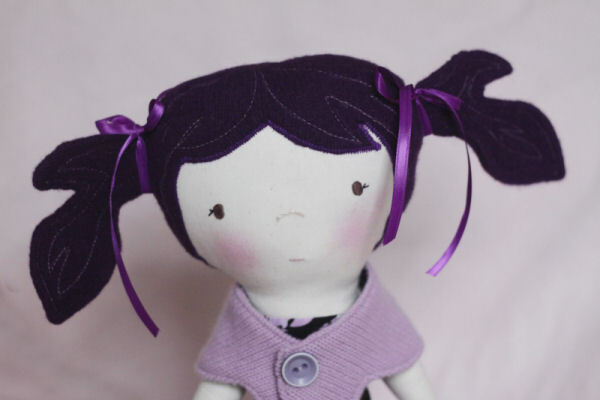 Violetta is proud to wear her purple in support of Epilepsy awareness-it is not something most people are knowledgeable about! And she is glad to help little girls feel special too. 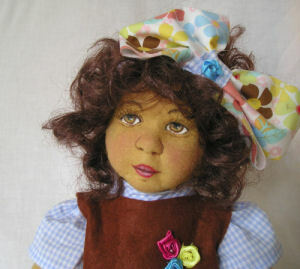 She is made using Judi Ward's pattern "BUG!" the fabric is a peach knit I stumbled across at joann fabrics. She was made to wear my grand daughters first b-day outfit. she can stand on her own and hold things in her hands. It became a bit windy when taking photos and she held on to the balloons with all she had. She only face planted a couple times, but got right back up to finish. 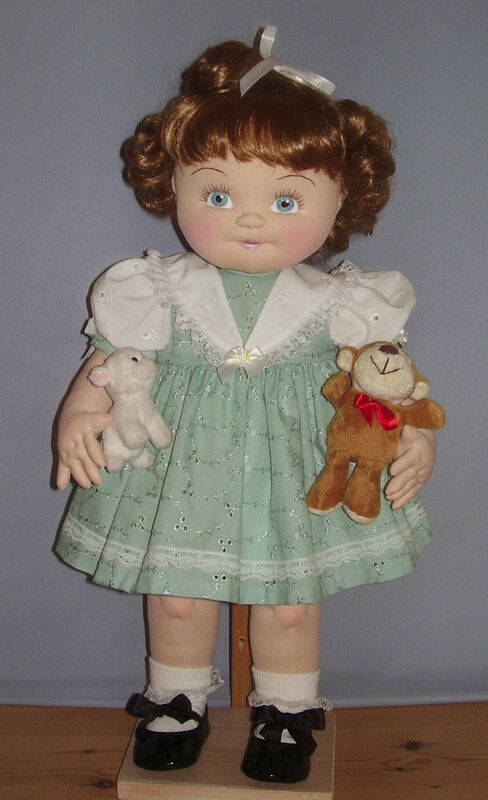 Sophia is 20" tall and made of soft deersuede. She has hand painted acrylic features. Sophia represents the way little girls used to dress. 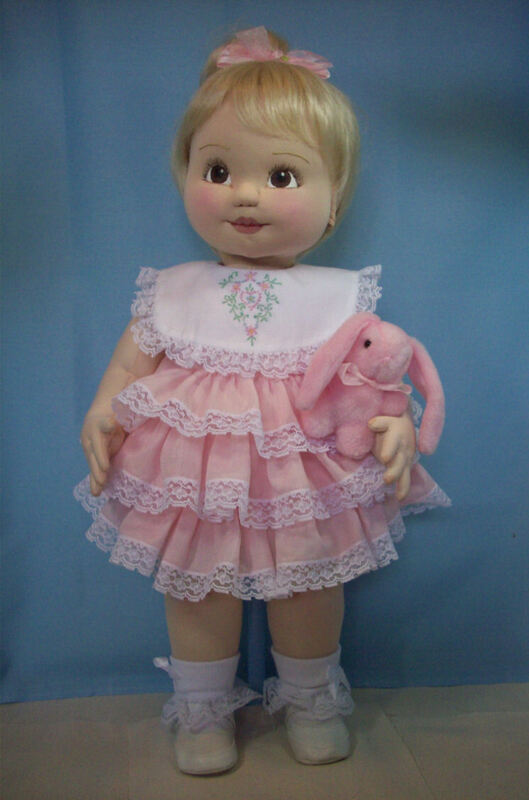 She wears a handmade bunny dress with a full skirt and puff sleeves and her sash is tied with a big bow. 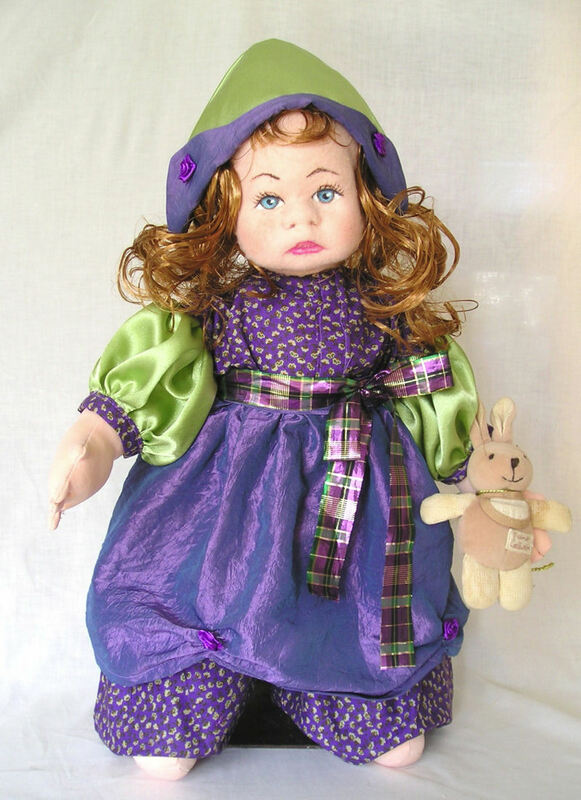 Her purple socks and yellow Mary Jane shoes are store bought. She has a bow in her blonde bobbed hair. Sophia has fingernails, made with Modpodge, that are painted with lavender nail polish. She carries her favorite Boyd bunny. 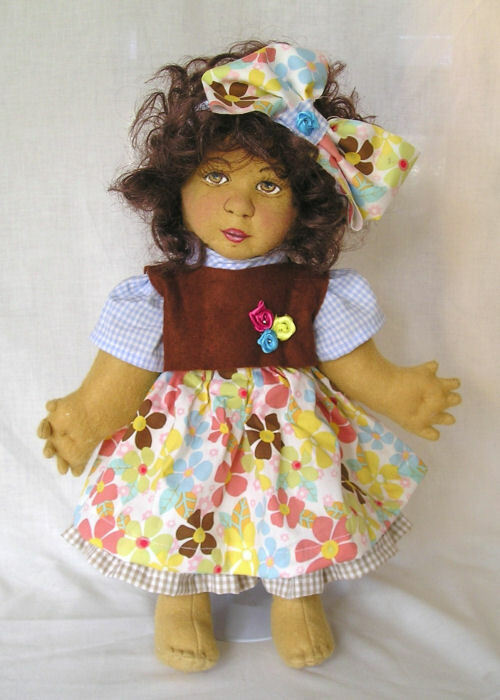 She was made from a combination of 2 patterns: Annie Bee'ds Knees by Judy Ward and Margreth from Michelle Munzone. I have noticed children today are dressed more and more like mini adults. I wanted to create a doll that complimented the soft and feminine way little girls dressed several years ago. Molly,a 3 year old Prima Donna in the making! Molly is approximately 22" long. 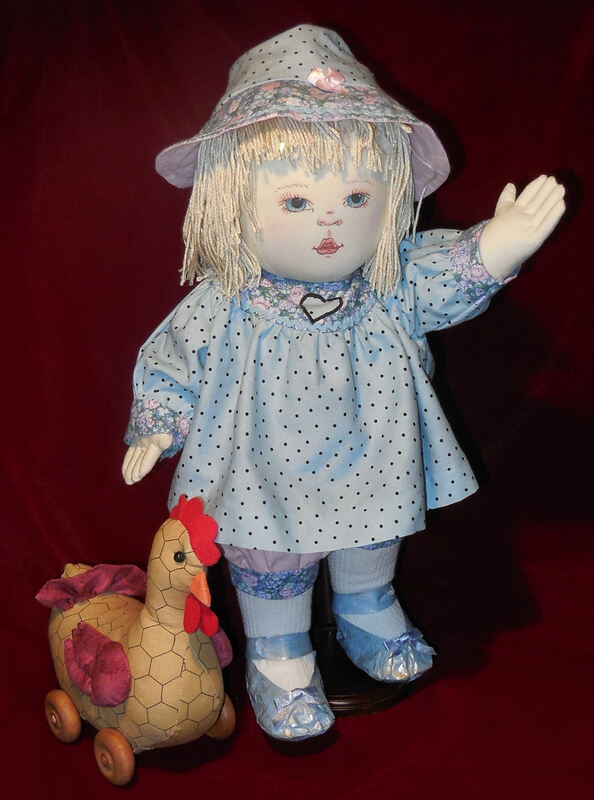 She was constructed from craft cotton using a combination of Judi Ward's pattern for "Bobbi" a simple baby doll from which I used the body & limbs & Kezi Matthew's pattern for "Blye & Colton" which I increased the size of the head to fit the "Bobbi" body. I painted the face entirely freehand using acrylics,coloured pencils,fineliner pens & blusher. I made the hair from knitting yarn & sewed it around the head & then pulled it up into a ballerina bun. The ballet dress,tutu,pants & shoes are of my own design & make. The bolero wrap was knitted by myself from a purchased 1st size pattern. Molly's bracelet spells her name in alphabet beads strung on to fine ribbon. Molly is always dancing & her favourite ballet is "The Nutcracker Suite"..
James is designed to be playable and cruelty free. His skin is 100% cotton jersey and he is stuffed with soft, sustainable kapok. His hair is of brushed crochet bamboo/cotton blend. 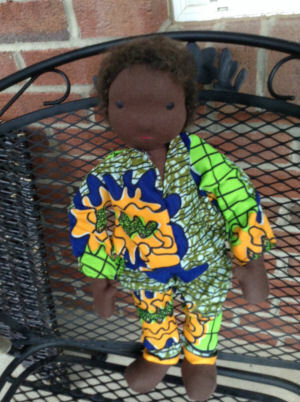 He is approximately 18 inches tall and can fit American girl style clothing patterns. He is modeling a light cotton print outfit made from cloth brought from Sierra Leone, from an original pattern. His feet can wear ready made newborn size shoes. James doesn't remember the civil war that tore his country apart. He didn't grow older with the threat of losing a limb, or become a child soldier. He attends primary school, and has started helping with farming at home. His strength is patience and agility. He wears these clothes for his neighbors wedding. He doesn't like them. He would much rather wear his shorts and go play football. 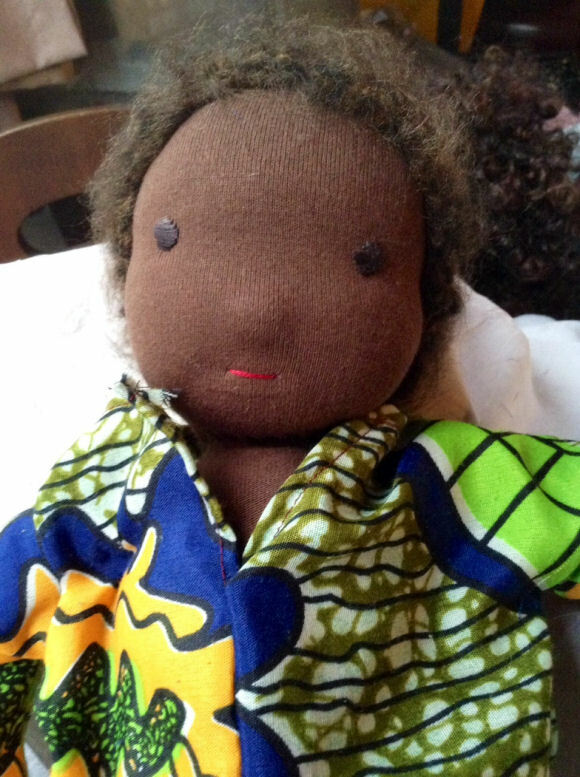 My name is Amanda and Mummy made me from Kezi's Tyler pattern. 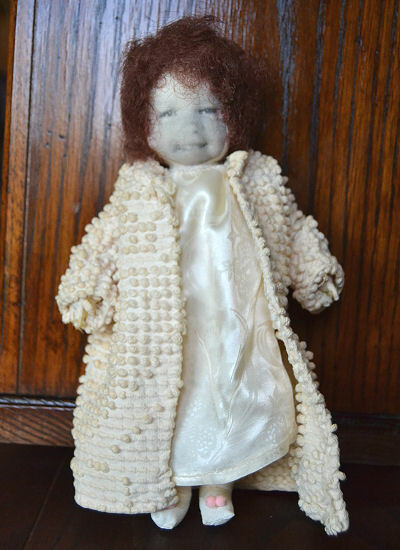 I am made of cotton and my hair is made from eyelash yarn. 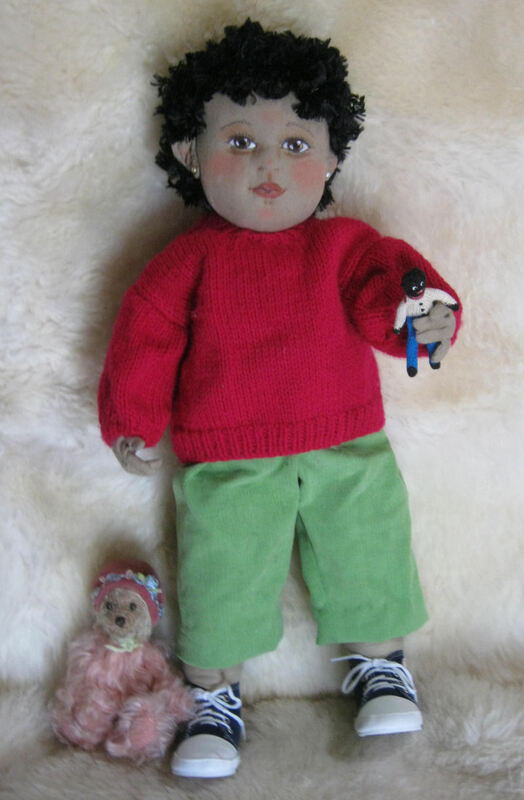 Mummy made my clothes and also my little knitted Golly and my bear. I am a real Kiwi kid. 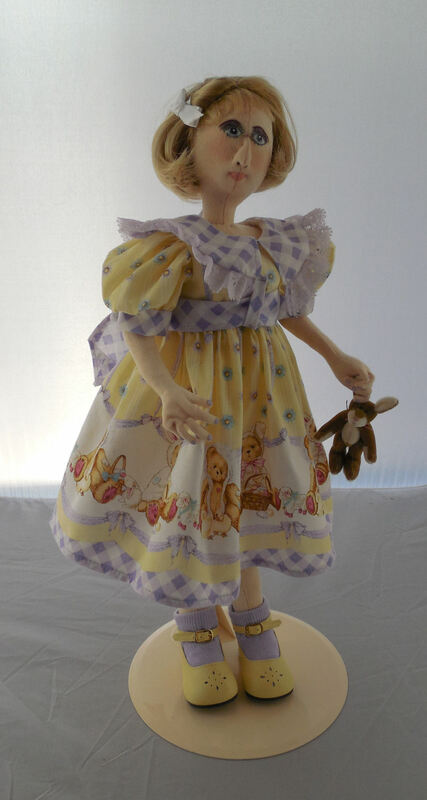 I chose a pattern from Jeanlee Dolls that had hands with fingers and feet with toes included to make my first Waldorf doll. After choosing the pattern, I watched videos and tutorials on YouTube and Pinterest. Before even starting my doll though, I taught myself how to knit; after-all, I wanted my girl to have a sweater or two. 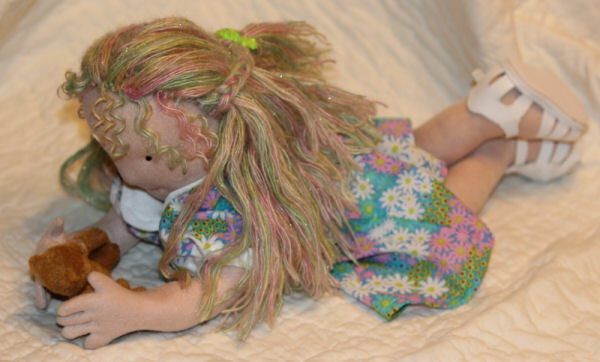 After getting her head made, I went shopping for hair at a local weaver's shop, and chose a fine, sparkly, colorful, hand-spun yarn that became the inspiration for her name - Rainbow. After watching some videos, I decided to crochet a base cap and then attached it to her head, hooking the hairs onto the base cap. Feeling something was missing, I also added the little curls. I found fabrics for her dress to match the sweaters I made, and already had the shoes. I tweaked the original pattern, adding my own special touch to Rainbow by adding wire to her fingers so that she could grip and hold things. 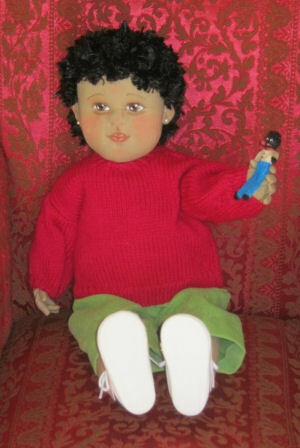 It was a fun and challenging experience - I not only know how to make a Waldorf doll now, but I also taught myself how to knit! 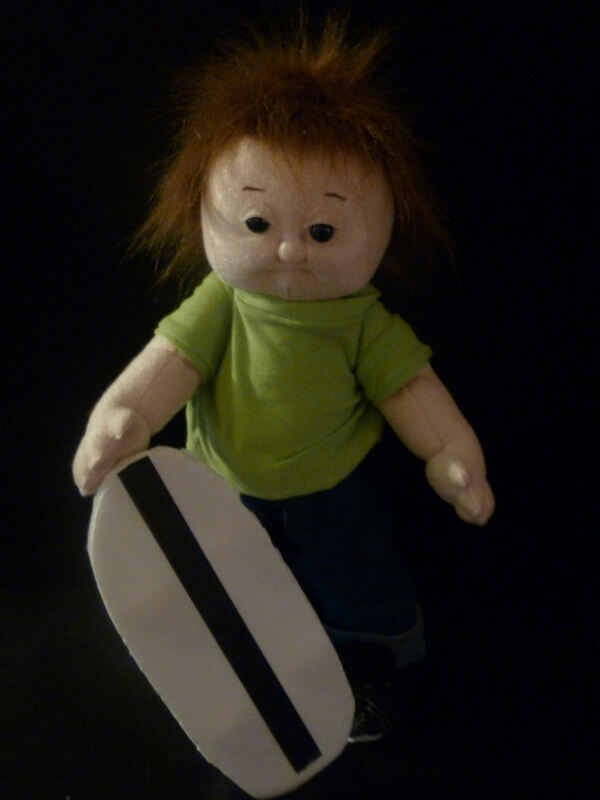 Josh is an aspiring skate boarder. He is eager to learn how to skate, but sometimes falls down. 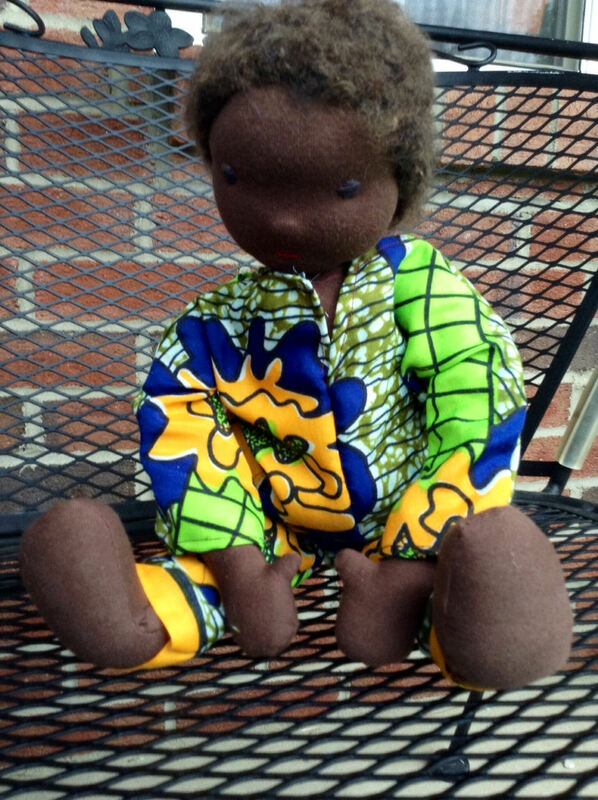 Josh is made using Carolee Creations Josh pattern. He is made of soft pink craft velour. He measures approximately 18 inches tall. 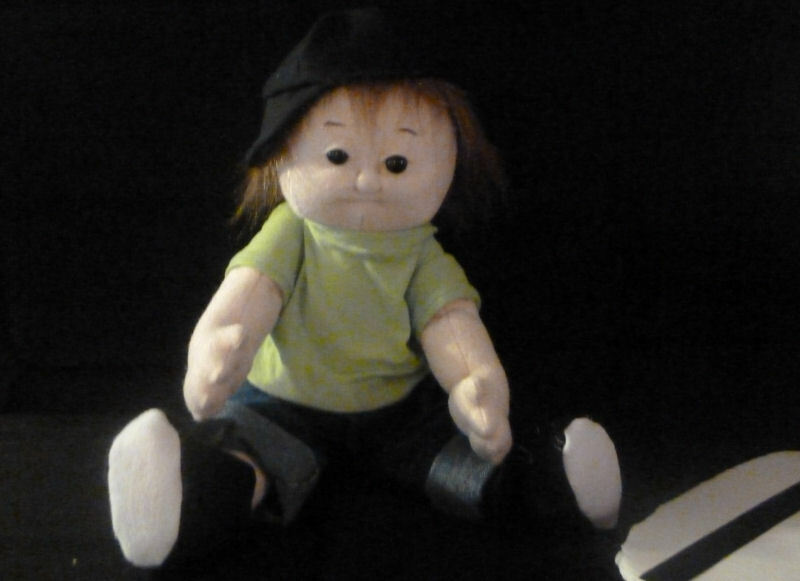 He has craft fur hair that is a little out of control but can be contained with his ball cap. All of Josh's clothes are handmade. His pants are made from denim, his shirt is a knit fabric. Josh's shoes are made from felt and his hat from black broadcloth. His skateboard is handmade as well using craft foam and wooden spools. This is Angelica my little child doll. 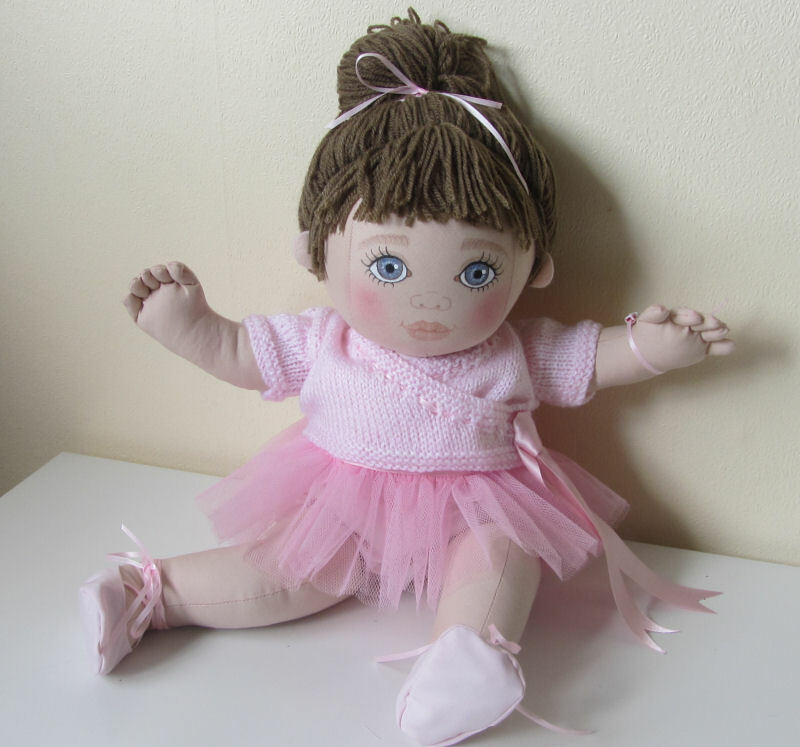 I made her by Darlene Rausch's beautiful Dee Ann doll pattern and she has seamless face. I really enjoy making dolls from her great patterns. Angelica is approximately 22 inches tall. She is soft sculpted and made from polyester knit. I painted her eyes and mouth with acrylic paints. 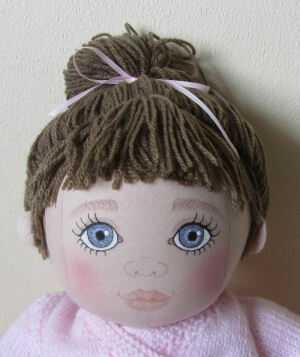 Eyelids and eyebrows are embroidered. 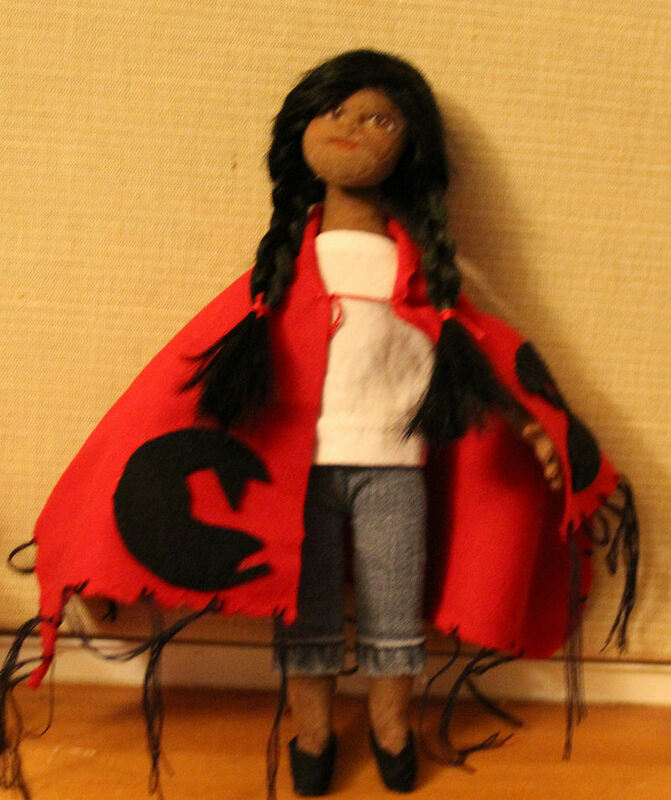 She has plastic joints in her arms, but legs are seam jointed. Her hair is strawberry blonde color purchased wig, which is hand stitched to her head. trimmed with lace. Her black patent shoes, her lace trimmed white socks and her toys are purchased. 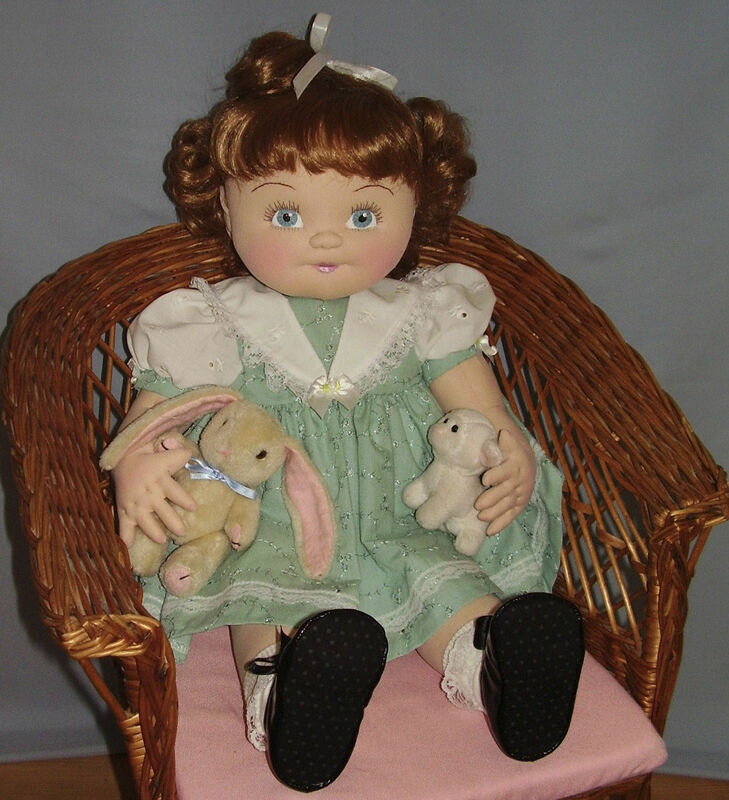 This doll is made using the Viola Ruth pattern and Pressmold by Deana Hogan. She's in muslin. She's stuffed with polyester fiberfill. 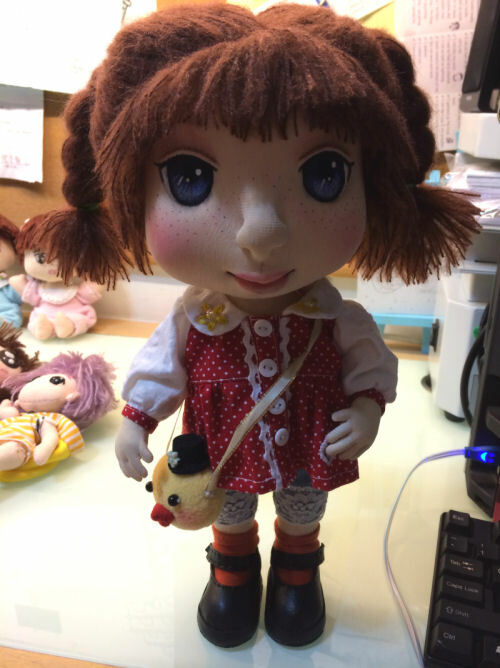 Her head is made of paperclay and covered with jersey cloth which is gessoed and painted. Her clothes are made from the pattern, too. I just add socks and shoes. The hair is alpaca. It's very soft. 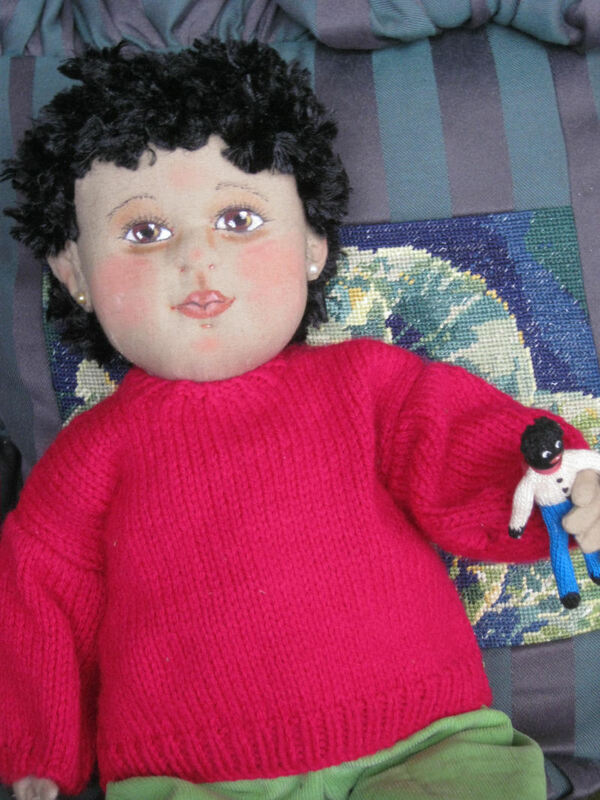 This doll is a tweeked version of Kezis' doll pattern called Ruthie. She has a wig that was bought not made by me. Everything else including her shoes are made by me. 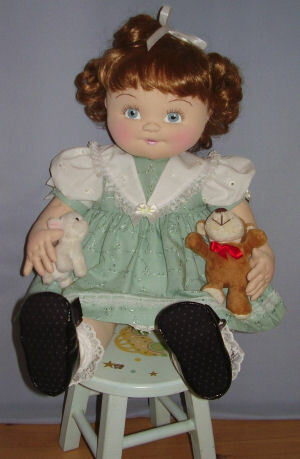 I named my version of this doll Savannah after a niece of mine. 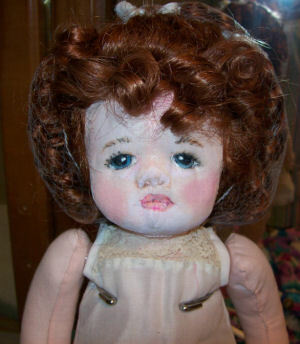 She has a beautiful southern blush with a lady disposition. 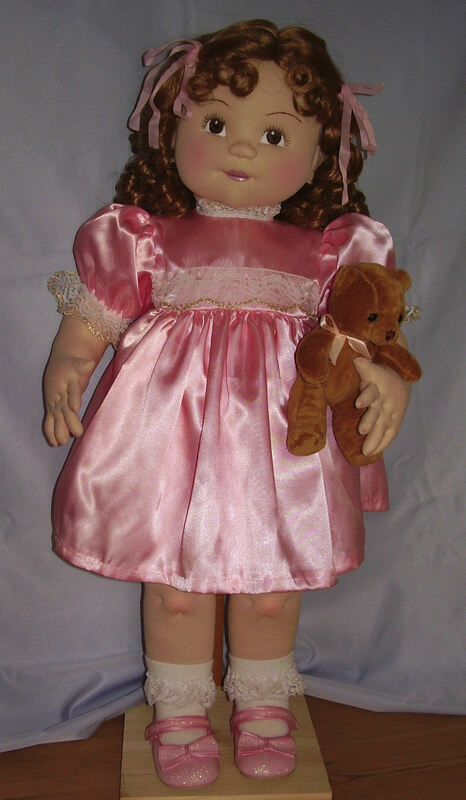 Paola is a cloth doll with molded face. Her body is made with cloth with my own pattern. Her face is made with air-dry clay out of a mold, covered with fabric and hand painted with acrylics. Her hands have been wired for movement. I made also her clothing and made her hair from a real wig. Gabriela is a cloth doll with molded face. 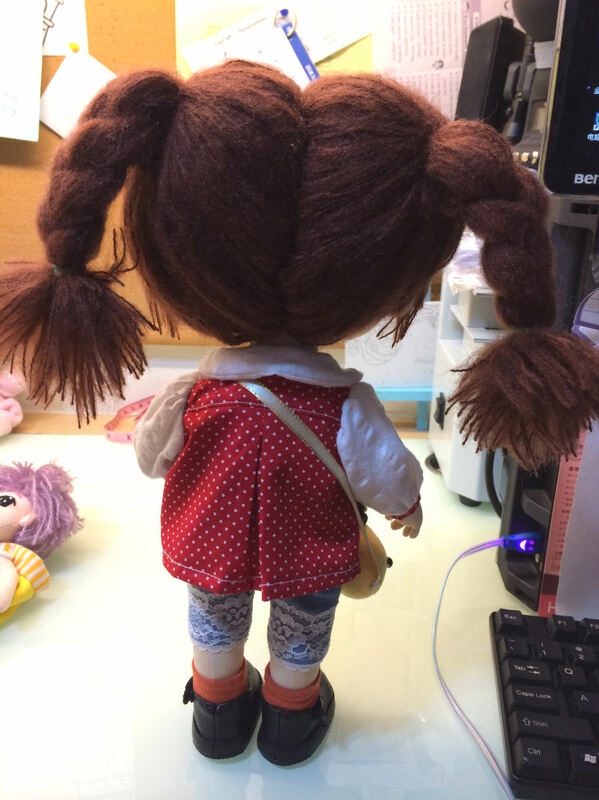 Her body is made with cloth with my own pattern. 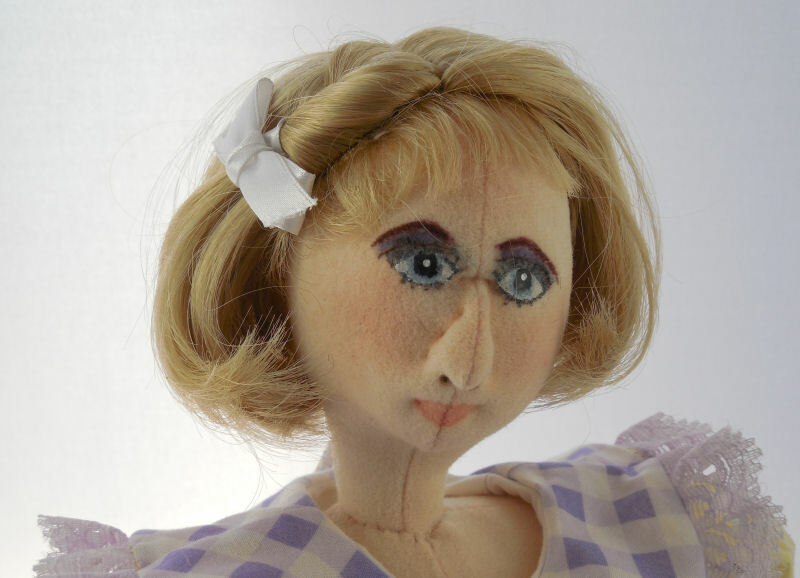 Her face is made with air-dry clay out of a mold, covered with fabric and hand painted with acrylics. Her hands have been wired for movement. 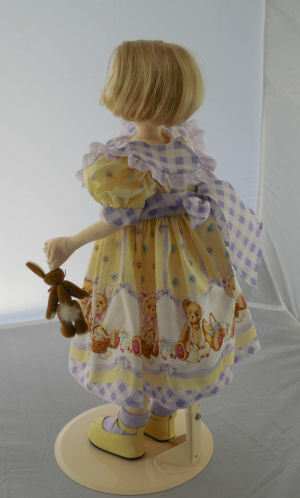 I made also her clothing and made her hair from a real wig.